Have you ever been invited to a dinner party? No, I’m not talking about a booze fest at your college’s frat house. I mean a party where you are going to a friend’s house and they are going to feed you while you socialize. If you’ve ever been to one of those parties, I hope you didn’t show up empty handed. It’s always nice to bring a small gift, and a bottle of wine is usually appropriate (assuming they like wine and aren’t recovering alcoholics. Definitely don’t bring booze to a recovering alcoholic). Tag and I have a recurring weekly invite to my Aunt and Uncle’s house for dinner every Sunday. When we go, we always bring a bottle of wine as a thank you for the invite. So if you’re like me and you bring wine as gifts, or if you’re like most people and you drink wine, I’m going to tell you why wine is a better investment than the stock market. At almost all the grocery stores in Dallas, you can buy wine at the regular price or if you buy at least 6 bottles then you’ll save 10% on your wine purchase. For years I would buy a bottle of wine on the way to Sunday dinner and pay full price. It finally hit me that if I put up an initial investment of six bottles then I will make less trips to the grocery store and I’ll save 10%. Then you consider my 2% cash back credit card, and I’m getting a 12% return from buying wine. Oh, and don’t forget about inflation. If the price of wine goes up a month from now, I’ve already bought at the lower price, which means I could save even more money. There’s also the added benefit of having a bunch of wine in your pantry. 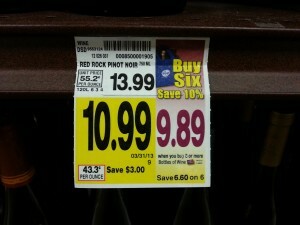 I think wine gets better as it ages (although maybe $10 bottles of wine don’t count). It’s also nice to know that if some terrible earthquake or terrorist attack hits, I can ride out the storm with some comforting drinks. If you talk to any financial advisor and ask what return you should expect to get in the stock market, and they will tell you around 7%. If they are a bit more aggressive they might say up to 10% but I doubt you’ll ever see anything higher than that. And remember that 7% is what they hope for. It could be 10-15%, but it could also be negative 20%. A 7% return is seen as a “good” year. I just showed you that I get a 12% return on investment from buying wine. That blows even aggressive stock market investing out of the water. Are you rethinking your investment plans yet? It’s obvious that a small guaranteed return on investment is much better than a small potential return on investment. If you only have a few hundred dollars to invest, you are much better off buying something you know you’ll need when it’s on sale. Some people will say, “That’s not investing! That’s spending!” Those people would be wrong. Buying a brand new car and getting a “good deal” is spending money. Buying the necessities of life that you’ll buy anyway, but doing it at a lower price due to a large purchase, is investing a sum of money now to reap returns in the future. In fact, I strongly recommend buying a lot any food item you eat regularly if it’s on sale. If you buy a box of Rice Krispies every week at $3.50 a box, and today they are selling for $2.50 a box, go ahead and buy 10. That’s a 28.5% guaranteed return. Heck, you might want to buy as much as you can store (and will eat before the expiration date). I’m not saying you should avoid the stock market entirely. I’m just pointing out the indisputable truth that buying food in bulk or on sale is a guaranteed return on investment, and it gives you a little more food in your pantry in case of an emergency. Readers: Do you save money by buying lots of food or beverages when you can get a bulk discount? Absolutely. We have a shelving unit at the bottom of our basement which contains the results of our bulk purchase savings. This comes from buying things at Costco, items at the grocery store when we can get them cheap, Aldi, or other areas which we can get a lot of something. It’s extremely rare when we have anything go to waste, I can’t think of a single item over the last twelve months. I accomplish this by continuously organizing the shelves, at least once per month. During this exercise, I’ll move things around so that any items expiring first are moved to the front. By going through everything every month, I’ll ‘see’ and/or ‘touch’ every item, which makes sure that we know what we have and what we need to use up soon. It also lets me know what we’re starting to run out of, and if it’s items that we use reguarly (e.g. pasta, jar spaghetti sauce), we know to keep an extra eye open for deals so that we can stock up again. We have a very healthy wine collection (120ish bottles) since my wife worked at a winery part time for a while. So when we get an invite people know we are bring a bottle or two. Of course part of our collection has some more expensive wines from our travels. We have a goal to visit a winery in each of the 50 states (we check Alaska does have a couple). Its really not that expensive of a habit and when we open a wine from a place we visited it brings back the memories! Also I am not rethinking my investment plans. You can invest your money in cereal and I’ll invest my money in the company that makes your cereal and then we can both win. The deals are even better with bottles of hard liquor. Even if you don’t drink it often, 1.75L is usually <2x the price of a 750ml bottle! It could take you 5 years to drink and you'd still match the market average. I can't wrap my head around how alcohol of any type is priced. There's huge incentives to buy in bulk. Heh heh, that’s why wine isn’t an investment for me. They will be gone pretty quickly.